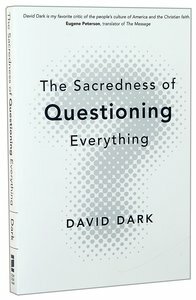 In this provocative, entertaining book, author David Dark writes, "The summons to sacred questioning, like a call to honesty, like a call to prayer, is a call to be true and to let the chips fall where they may." Far from being a sign of cynicism or weakness, questions are not only positive but crucial for our health and well-being. ^^The freedom to question - asking and being asked - is an indispensable and sacred practice that is absolutely vital to the health of our communities. ^ ^According to author David Dark, when religion won't tolerate questions, objections, or differences of opinion, and when it only brings to the table threats of excommunication, violence, and hellfire, it does not allow people to discover for themselves what they truly believe. ^ ^The God of the Bible not only encourages questions; the God of the Bible demands them. If that were not so, we wouldn't live in a world of such rich, God-given complexity in which wide-eyed wonder is part and parcel of the human condition. Dark contends that it's OK to question life, the Bible, faith, the media, emotions, language, government - everything. God has nothing to hide. And neither should people of faith. ^ ^The Sacredness of Questioning offers a wide-ranging, insightful, and often entertaining discussion that draws on a variety of sources, including religious texts and popular culture. It is a book that readers will likely cherish- and recommend - for years to come. About "The Sacredness of Questioning Everything"
Is Your God Big Enough to Be Questioned? The freedom to question is an indispensable and sacred practice that is absolutely vital to the health of our communities. According to author David Dark, when religion won't tolerate questions, objections, or differences of opinion, and when it only brings to the table threats of excommunication, violence, and hellfire, it obstructs our ability to think, empathize, and live lives of authenticity and genuine engagement. The God of the Bible not only encourages questions; the God of the Bible demands them. If that were not so, we wouldn't live in a world of such rich, God-given complexity in which wide-eyed wonder is part and parcel of the human condition. The possibility of redemption and revolution depends on the questions we ask of God, governments, media, and everyday economies. It is by way of the questions that we resist the conformity that deadens and come alive to visions that redeem.